We decided it was finally time to depart Rangeley this morning after breakfast. We quickly got a hitch out of town from a nice local guy who was really into all the various hunting seasons they have up here, including the lottery-based moose hunt. We were hiking a little before 9am. We had some pretty big mountain climbs today going over Saddleback, The Horn, and Saddleback Junior. 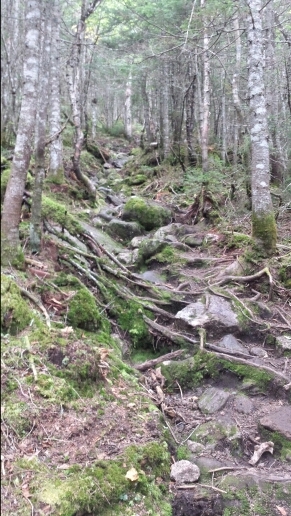 The climb to Saddleback was very root-filled and slow until we got up above treeline. Once we got up there, we had multiple false summits, but it was pretty nice hiking so we didn’t mind. We then hiked down some steep and slick trail and then back up to The Horn. 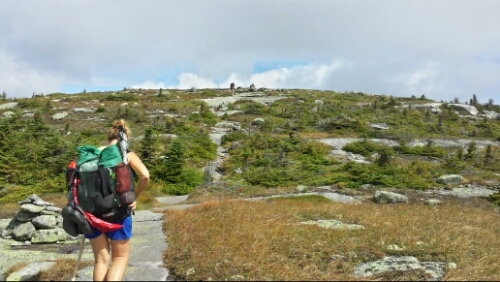 We grabbed some lunch and chatted with some other thru-hikers up there. We got a bit of rain shortly after that as we descended The Horn and ascended the last of the 3 peaks on this range, Saddleback Junior. By the time we summited, the rain had blown out and it was sunny again. The clouds were blowing through fast all day. A lot of the trail was tricky today, with loads of wet roots and rocks to contend with. We hiked down off that ridge and then briefly back up the next ridge and then found a little stealth spot off the Sluice Brook. 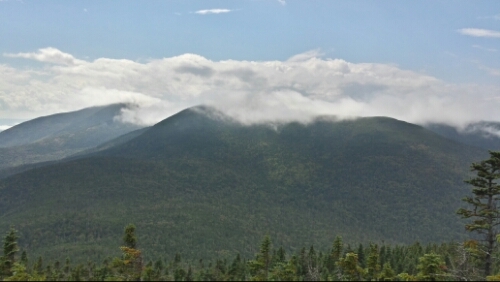 Tomorrow we have the fairly large Spaulding/Sugarloaf/Crocker range to tackle. This entry was posted in updates on September 2, 2014 by Joel. Fly like a moose to The Big K! The moose flights and sneaker wings will surely get you to Mt. 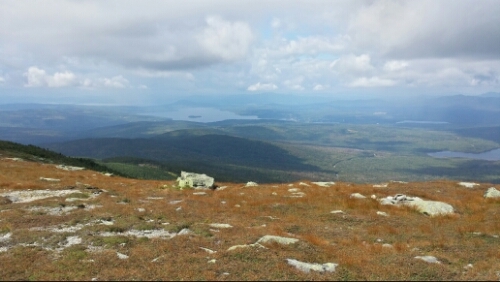 Katahdin!! Up and down…up and down…up and down. There really is nothing wrong with walking on a level surface…just in case you didn’t know that! 🙂 When Cowboy was very, very young, he would climb on the kitchen table and then just sit there…quite content. Was this the start of the climbing thing? Missing you in HOT Lewes (temperature…not activity) but looking forward to seeing you soon in Maine! Woohoo! Be safe and stay healthy. Sending up-and-down-and-up-and-down thoughts, MANY more prayers and mountains of love. Take care.